Enjoy a delightful massage at your workplace in Philadelphia, Pennsylvania. Our team of skilled massage therapists is ready to ensure that you are able to concentrate on your work while feeling less stress, greater energy, and less pain. In just 10 minutes THERAPEUTIC INNOVATIONS can help reduce your blood pressure, heart rate, and overall stress. Feel rejuvenated today by allowing our team to come to you and your coworkers for a truly relaxing break without disrupting daily business. A massage is a natural stress reliever. A happy, refreshed workforce is a productive one. By relieving sore and tight muscles with an office massage, you can help your colleagues better focus on the task at hand, without feeling the need to rest more or head home to heal. It can also improve immune system response, and reduce employee absences due to seasonal ailments. A study published in the Journal of Alternative and Complementary Medicine™ in 2011 found that twice-a-week chair massages help reduce musculoskeletal aches and pain, while improving the patients' range of motion after a month. 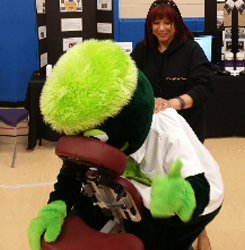 In 2012, Complementary Therapies in Clinical Practice™ chronicles a study showing that a 15-minute chair massage during working hours significantly reduced stress in nurses, enabling them to focus more on job-related to tasks without pain.